London — Newly identified bridge forms could enable significantly longer bridge spans to be achieved in the future, potentially making a crossing over the Strait of Gibraltar, from the Iberian Peninsula to Morocco, feasible. 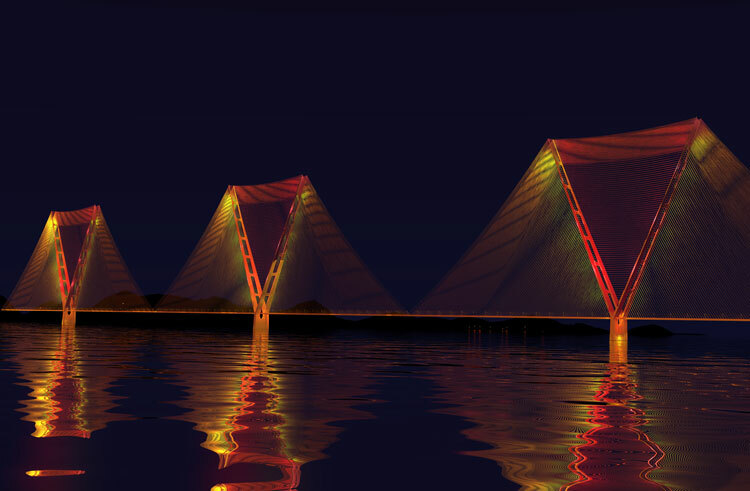 The new bridge forms — identified by a team of researchers from the University of Sheffield and Brunel University London, working with long span bridge expert Ian Firth of engineering consultants COWI — use a new mathematical modeling technique to identify optimal forms for very long-span bridges. The research is published on Sept. 19, 2018 in the Proceedings of the Royal Society. By incorporating this early 19th century theory into a modern mathematical optimization model, the team have identified bridge concepts that require the minimum possible volume of material, potentially making significantly longer spans feasible. The team emphasize that their research is just the first step, and that the ideas cannot be developed immediately for construction of a mega span bridge. The current model considers only gravity loads and does not yet consider dynamic forces arising from traffic or wind loading. Further work is also required to address construction and maintenance issues. The research, funded by the Engineering and Physical Sciences Research Council (EPSRC), is also being presented today (19 September 2018) at ‘Tomorrow’s Megastructures’, a symposium organized by the International Association for Bridge and Structural Engineering.